Just one point separates Readers Lincolnshire ECB Premier League leaders Bracebridge Heath and challengers Woodhall Spa after a weekend of unpredictable results. Bracebridge Heath managed to defend a meagre 150 at Market Deeping while Woodhall beat Skegness by just six runs. Elsewhere, Joe Peck returned the season’s best bowling figures of 8-43 in Grantham’s victory over Lindum and Laurence Scott hit the day’s only century with 117 for Louth who went on to beat current champions Bourne. Tom Andrews and Mehul Adatia each took four wickets for Market Deeping. who reduced Bracebridge to 55-6 before Hymie Bentley and Carl Stubbs joined forces in a partnership of 71. 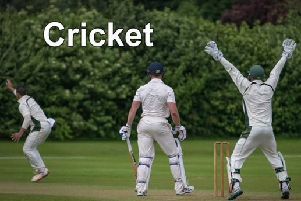 In reply, Deeping lost two wickets for 15 runs but Chris Jones and Emile Kriek appeared to have put their side on the road to victory with a stand of 56. However, the return of Himesh Silva to the attack brought four wickets and 16-year-old Alex Moor claimed three, including Jones for 55, as Deeping were all out for 132. At Jubilee Park, Sam Evison hit 65 of his side’s 178, Norman Brackley taking five wickets for Skegness who finished 172 all out despite Pradeep Chanditha’s knock of 81. Charles Wright was Grantham’s top scorer with 33 as Lindum reduced the home side to 39-3 then 83-6. Wright and Matthew Wing added 32 and the lower order chipped in to help the total to 153 for nine, Ryan Sneddon and Jonny Miller each taking three wickets. Peck then began his devastating attack and Lindum found themselves 25-7. Once again it was the tail enders who halted the slide, Tom Lindsay and Sneddon putting on 38 and Lindsay and Joe Peatman 44. Peck bowled out his 17 overs but it was Oliver Clawson who finally dismissed Lindsay for 35 to end the Lindum innings on 117. This left Grantham still in the relegation zone but now 14 points ahead of Spalding who fought out a losing draw at home to Grimsby. The visitors finally regained some batting form, Steve Crossley hitting 46 and skipper Lee Charlton coming in at seven to make an unbeaten 52 and help his side to 199-7 at the close. Spalding also lost early wickets but Josh Newton (37) and Dan Milgate looked to have halted the slide. However, the Grimsby bowlers stuck to their task and Spalding gradually dropped behind the run rate, finishing on 148-9. This puts Grimsby five points ahead of Grantham and only one behind ninth-placed Skegness. Sleaford continued their climb up the table and now lie fifth, just four points off third place after beating Market Rasen. Louis Kimber hit 64 and Tom Shorthouse 63 as Sleaford recorded the day’s highest total of 262. Tim McIntosh took his runs total past the 450 mark with a knock of 43 in an opening partnership of 95 with Shorthouse while Seb Darke took four wickets for Rasen who, in reply, were reduced to 14 for two by Oliver Smith. Nick Goacher took four wickets and only Will Bradford with 28 had any answer to the Sleaford bowling as the final wicket fell on 80. Louth moved into sixth place in the table after Scott’s century helped them 236, the final wicket falling with an over to go. Colin Cheer finished with four wickets but Andy Carrington went one better as Bourne’s top order batsmen were unable to build a sizeable stand. Carrington took 5-43, number seven Tom Dixon top scoring with 39 as Bourne were all out for 151. Results: Louth 236 (Scott 117), Bourne 151 (Carrington 5-43); Sleaford 262 (Kimber 64, Shorthouse 63), Market Rasen 80; Bracebridge Heath 150, Market Deeping 132 (Jones 55); Grimsby 199-7 (Charlton 52), Spalding 148-9; Grantham 153-9, Lindum 117 (Peck 8-43); Woodhall Spa 178 (Evison 65, Brackley 5-43), Skegness 172 (Chanditha 81).